A club with a Worldwide membership, for owners, drivers and enthusiasts of Sunbeam Alpine sports cars manufactured by the Rootes Group between 1959 and 1968. The club is a friendly, UK based car club, run by enthusiastic volunteers providing opportunities for all Sunbeam Alpine enthusiasts to meet socially, obtain technical assistance and to enjoy their hobby, thus helping to ensure the preservation of a great British sports car for future generations. A varied range of local social and friendly events are organised throughout the year, and a bi-monthly magazine called ‘The Alpine Horn’ is published which contains a good selection of members’ news, technical information and advertisements. We are proud members of the Federation of British Historic Vehicle Clubs, the Association of Rootes Car Clubs and supporter of the Rootes Archive Centre Trust. Attend all of the major National classic car shows including the NEC Classic Motor Show, Practical Classics Restoration Show. 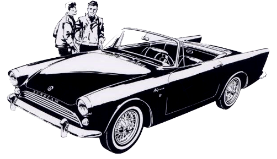 Joining the Sunbeam Alpine Owners Club is easy and can be done online. We are always willing to offer help finding or viewing a car, even to non-members. Have a look around the website to learn more about our fantastic club and the cars we support. Click to book tickets now! Come and join us on the Club stand.